In a week of disciplinary controversies, rugby's scoring system has not been top of the Six Nations agenda. But Shaun Edwards, Wales' defence coach, raised the matter five days after England's 25-21 win at Twickenham. "To be honest I'm just still in a bit of disbelief that you can lose a game of rugby having scored three tries to one," he said. "I tried to explain to my mother, who's from Wigan, and she just didn't understand it." England's win - the only match in this year's tournament where the losing team scored more tries than the winners - was the fourth leg of a potential Grand Slam. Wales face Italy in Cardiff on Saturday in their last match of the 2016 Six Nations, aiming for a win to claim second place behind England. 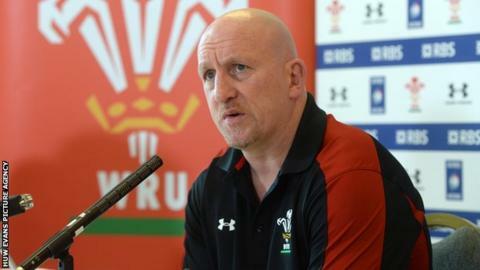 In the circumstances Edwards' comments could easily invite accusations of sour grapes, particularly after a game when Wales missed 26 tackles - his area of responsibility. But the scoring in rugby union is already under official scrutiny. Edwards' reference to his mother living in Wigan points to his roots in rugby league, where he represented Wigan and Great Britain. Under that sport's scoring system, the match in Twickenham would have been an 18-18 draw. World Rugby - union's governing body - is currently trialling a scoring system in semi-professional and amateur rugby. It is the one used in Wales' lower leagues where a try is worth six points and all kicks two. In top level rugby a try is worth five points, a conversion two points and penalties and drop-goals three points. Wales would have beaten England 24-20 at Twickenham if that system had been in force. Pontypridd's Alex Webber scored the first six-point try in Wales in his team's 68-32 win over Llanelli on 5 September, 2015. When the experiment was announced it was said to be aimed at encouraging attacking rugby and keeping the ball in play for as long as possible. England World Cup winner Josh Lewsey, at the time the Welsh Rugby Union's head of rugby, said: "I am delighted the Welsh Rugby Union is taking a lead in the world game in regards to these law trials. "Internally, we were already exploring innovative ways in which we could increase 'ball in play time', the focus on skill acquisition and match intensity. "As such, these law trials are a superb fit for our intentions." There are few who would argue Wales were the better side at Twickenham and England butchered a couple of golden opportunities in a dominant first-half. Edwards was unhappy with Wales' first 40 minutes, but claimed the statistics could be interpreted positively. "We conceded one try away against England and if you look at that stat it's not a bad performance," he added. "Technically there were certain aspects of our defence which I was disappointed with in the first half, mainly our one-on-one tackling against their number 11, 14 and 15. But statistically one try [conceded] away against England is not a bad effort. "Was I happy at half-time? No I wasn't. Did we perform a lot better second half? Yeah we did. "I'm under no illusions. We were not on our game in the first half but I still can't get my head around how we can score three tries, they can score one, and we can still lose." Down in the Swalec League at places like Glais and Rhigos and Brynmawr and Blaenavon they might agree.